Decorating a teen’s room is a little bit you, but a whole lot them. You may have noticed that the older your kids become, the more they want to show how different they are from Mom and Dad. This is especially true once they hit their teenage years. You like Facebook; they prefer Snapchat and Instagram. You watch TV and go to movies; they are totally about YouTube and the online streaming experience. They shop at different stores, listen to different music, and have a vocabulary that is distinctively different from your own. One of the best opportunities for teens to show their distinct personalities is when decorating their own rooms. It’s in this, their private domain, that they can experiment with colors, create a shrine to the pop culture heroes, and set up their own personal space for playing video games, listening to music, doing their homework and hanging out with friends. Teens may have the confidence to make decorating choices themselves—although they may actually surprise you by asking your opinion. With that in mind, here are some tips you can share with your teen for creating a room that is exactly how they want it to be. Choosing their paint colors is a way that teens can really express themselves. Teens tend to go bolder with color choices than their parents. Among the choices they may consider are dark purples, deep reds, cobalt blues—even black. 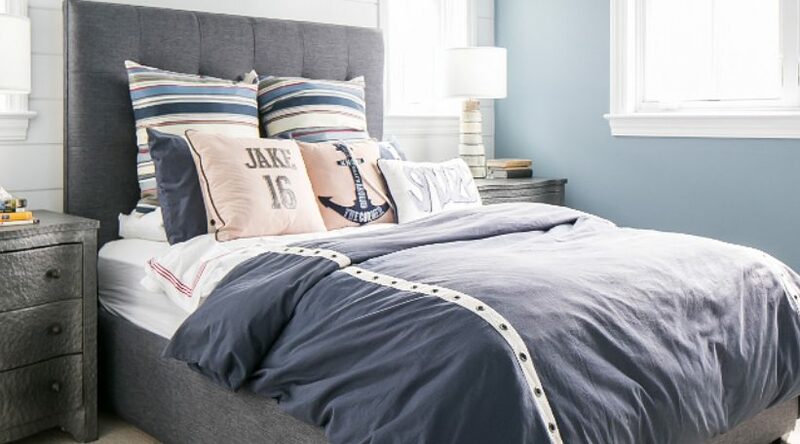 Make sure your teen understands that these darker colors are going to make the room look smaller—and maybe that’s okay. But in some cases, they may want to go with a lighter color or neutral tone as a backdrop to highlight their wall décor. There are still gender preferences when it comes to color, even in the teen years—though it’s a lot more complicated than pink for girls and blue for boys. Girls may still want a feminine choice like lavender or pale green. If they do go with pink, it’s likely to be more of a magenta or the “hot” version of the color. Boys might be more inclined to go with browns, dark tans or a cobalt blue. However, many of today’s teens are not hung up by so-called gender norms and just want to choose a color that expresses their personality. Wall décor is a major expression of a teen’s personality. A lot of times, teens will keep it simple and just go with posters of their favorite pop personalities. However, they also may wish to express their preferences with a painted wall mural. Talented muralists for hire can paint anything from comic book characters to aquatic scenes to monster trucks “crashing” through the walls. If your teen is a talented artist in his or her own right, their room is the space where they can give those creative instincts an outlet. Subject matter is constrained only by your teen’s imagination. And remember—it’s only paint. You can always paint over it if it doesn’t turn out as planned. One of the ways that teens express themselves is with furnishings. Certainly, the bed is the centerpiece of the room. By their teen years, kids have outgrown the desire to depict cartoon characters on their bedspreads. Better choices for this age group include geometric patterns, florals, stripes, paisleys or solid colors ranging from the subtle to the bold. Color themes exhibited on the walls and in the bedding can be picked up again with area rugs and window treatments. Window treatments may be as simple as mini-blinds for privacy, though curtains or valances add another opportunity for self-expression. Additional furnishings may include beanbag or saucer chairs—perfect for playing video games with friends. And some teens might even like a hammock-style chair swing as a unique and fun way to lounge in their rooms. An important component of a teen’s room is the homework area. A lot of times, a functional desk and chair is all that is needed—though for teens who use laptops, a comfortable accent chair with side table may be a more comfortable and space-efficient alternative. To keep themselves organized for school and other activities, teens might like the idea of peel-n-stick dry-erase calendars or “to-do” lists. Chalkboard walls are another possibility for a teen who likes to jot everything down—or simply to draw or write down whimsical thoughts. It’s just another way to express themselves, which is what today’s teens are all about.